Mimi and I begin our lives as a married couple. I spent the first 18 years of my life in the bucolic surroundings of rural coastal Maine, two hours from Canada and straight across the bay from Bar Harbor and Acadia National Park. It was a childhood as idyllic and sheltered as it was homogenized. In that span of 18 years, I never met a Jew. Yet by the time of my 30th birthday, I was well on my way to converting to Judaism - despite a deep suspicion of organized religion and a complete aversion to God. My birth certificate reads “Roman Catholic,” due to my mother, an Irish Catholic raised as an outsider in a town full of Protestants. My father, formerly a Pennsylvania Lutheran, converted before he married my mom. My older brother by 15 years was a dedicated altar boy. All signs would seem to point to at least a modicum of religious instruction in my young life, but my family had grown disenchanted with the local parish. My dad was involved in a bitter land dispute with a congregant that colored his opinion of the entire church. In our house, the word “church” came to be associated with the words “hypocrite,” “fraud,” and “greed.” When we drove by the simple white steeple, cars filling up the parking lot, all I could think about were the “wicked liars” and “sanctimonious phonies” filling up the pews. By the time I left for college, I was certain religion would never be a force in my life, except one to rail against. My first encounter with Judaism occurred one fall day in my freshman year on the Wheaton College campus. For some reason, students in tiny circular hats were constructing small structures with pine boughs thrown across the top. I knew these diligent men and women were Jewish, but there the specifics stopped. The whole enterprise struck me as slightly amusing and certainly silly and served to reinforce my superior standing as an atheist, the word I then employed to describe myself. That spring, some strange food started appearing in the cafeteria: large, flat crackers and a delicious paste of nuts and apples. At first I thought it had something to do with Easter, but I soon learned it was for the Jewish holiday of Passover. I really enjoyed those crackers, and the hard-boiled eggs that also made their appearance. I loaded up on this novel fare for at least a week until sadly it was gone and I was back to cold pizza and froyo. As I approached my senior year, I finally met someone who could explain these Jewish customs to me. Adar was to be one of four suite-mates with whom I’d be spending the year. His father was Israeli and his mom was a convert to Judaism. Adar had a strong activist streak and was very committed to his faith. Those tiny hats, he informed me, were called yarmulkes or kippot. Sometime over the course of my college career, I got it in my head that I was a playwright. At a professor’s urging, I applied to Brooklyn College’s graduate program in playwriting and, upon acceptance, set out for New York City. For some people, New York conjures up a romantic vision of the artist amid an inspiring swirl of cultural tumult. For me, a first-timer in the city, all it evoked were scenes from the film Taxi Driver, and a faint feeling of indigestion. I had no idea what to do with the multiplicity of people, races, ethnicities, and religions now unleashed upon me. Wheaton had been eye opening; New York was an onslaught. Adar enlightened me on the basics of kashrut, and on other practices, as I slowly acclimated to one of the most Jewish metropolises in the world. He turned out to be indispensable - for it was through him that I would meet my future wife. Adar had met a woman. It was one of those blithely romantic stories: He walked into a café near New York University and made eye contact with a beautiful redhead. He left and got halfway down the block before doubling back and asking her out for Indian food. For both Adar and Nora, it was love at first sight. Nora thought her roommate Mimi and I would also be a good fit. In fact, we hated each other. Rather, I ignored Mimi and she hated me for it. She was bright and effervescent; I was a brooding would-be playwright. I thought she was naïve; she thought I was full of myself. She was right; I was wrong. We began to date. Above all else, Mimi identified as a Jew. She came from a tight-knit Jewish family. Her grandparents had survived the Holocaust and her parents had met in Jerusalem. When Mimi took me home to meet her family one Friday evening, I was struck by the warmth her parents seemed to imbue in their surroundings; the Jewish art and music; the blessings over the candles, wine, and freshly baked challah; the animated discussion of thoughts and ideas. Later, Mimi explained that her family was more culturally Jewish then religiously so - a distinction that was news to me. As far as I knew, you believed in God and were therefore religious, or you did not and were an atheist. Jewish identity, I would later discover, was complex, embracing religion, ethnicity, and peoplehood. Some Jews identified more with one aspect than the others. And in the arena of religion, you could disagree, challenge, and freely voice your views. In fact, struggle and dissent seemed to be uniquely Jewish virtues. Mimi and I became serious and decided to marry. She didn’t ask me to convert to Judaism, and I didn’t volunteer. As I saw it then, conversion would have been an act of absolute hypocrisy. Visions of the imaginary parishioners of my youth, blabbing about God and then behaving with the moral acuity of apes, filled my head. A rabbi consented to marry us without my converting as long as we agreed to raise a Jewish family, and I took a class in Judaism to broaden the scope of my Jewish understanding. I agreed. I had no reservations about setting aside a few secular Christian holidays and deepening my knowledge of my wife-to-be’s faith. Mimi and I enrolled in a URJ Introduction to Judaism class. Two of the other students became representative of disparate yet converging “outsider” approaches to Judaism: one, a young highly educated woman, indignant, arms folded across her chest, ready to reject even the whiff of organized religion; the other, middle-aged, simpler, ready to adopt her husband’s faith without question or interest. The atheist and the appeaser had one thing in common: They had no intention of learning. I realized that my own rejection of spirituality was as rigid and uncompromising as theirs. I’d let my curiosity flow into every aspect of my life except this one. It was time to open my mind to the possibility that religion might have something to offer even me. In the intro course, I learned the meaning of the Jewish holidays and about Jewish philosophy and thinkers. I found Martin Buber’s concept of “I and Thou,” in which we have a choice to treat every human being as made in the Divine image, especially applicable. Living in a city as congested as New York, daily encounters with strangers can easily turn hostile or affirming, depending on one’s attitude. I also came to see that the organization of the Jewish calendar was, in fact, rational and life-enhancing, and didn’t require a specific belief in God to retain its power. Shabbat, heretofore something I deemed only an interruption of the weekend, now made sense as a chance to take pause and reflect on one’s life. Something began to shift within me. I started feeling that I wanted to convert. I’m not sure exactly why and when, but I think the seed lay in my own family. While in my growing-up years our family lacked religion, we certainly were immersed in our history. We knew where all our ancestors hailed from, how they came to America, and what they endured to arrive here. The more I discerned about Mimi’s forebears, the more important it became that our new family be Jewish. Her grandparents had been shot, starved, tortured, separated, and then reunited after liberation. They came to America to escape unspeakable evil and left behind a generation of ghosts. Because they survived, my wife, beautiful, free-spirited, and the delight of my life, had come into being and somehow crossed paths with me. In my mind, Mimi was Judaism, and our children would be the answer to the injustice done to her ancestors. One night I simply told her I was converting. She wept. She had wanted it so badly but had never wanted to compel me. Despite having made the decision, some doubts remained. I was sure that in order to convert I would need to affirm some sort of belief in God. Adopting Jewish practices was one thing; believing in God was another. I could not in good conscience declare myself Jewish if that meant accepting a higher power that in truth, I rejected. Seeking guidance, I posed this dilemma to Mimi’s father. His response was unwavering. For him, a commitment to leading a Jewish life and an earnest struggle with tradition and the meaning of God were more essential to Judaism than God belief itself. Emboldened, I continued the conversion process. Soon the day came for my immersion in a mikvah. I was nervous. I had to memorize the blessings, and memorization had never been my strong suit. But in those waters, the words spilled out easily, perhaps because I had come to this moment slowly and deliberately, with much thought. I submerged myself and surfaced with a feeling I’d never had regarding religion: confidence that I was on the right path. I chose the name Boaz and became Boaz ben Abraham. Shortly after my 30th birthday, I was Jewish. In the months that followed, my thoughts concerning God slowly began to evolve. I no longer considered God to be irrelevant to my life. When I was younger, my opinions on God had been definitive and resolute, but as I was becoming more attuned to the mystery of life around me, a sense of wonder crept in that I began attributing to God - not in any personified sense, but as something woven into the very essence of being. Shortly after converting, I attended a lecture at a Jewish conference given by an unabashed atheist. As evidence for his views, he showed images of the brains of meditating monks, caught in the rapture of communion with God. In the scan, you could see the physical spot where the brain was engulfed in activity. To him, this was proof: God was just in our heads, an illusion. But to many in the audience, the capacity of the brain to meet God in prayer, depicted scientifically or not, was still a wonder. One Orthodox woman piped up, “I think we’re saying the same thing, just differently.” She couldn’t have summed up my own views better: I was seeing the same things as before, just differently. It has been just over two years since I became a Jew. And now I feel challenged in a way I had never anticipated: How am I, how are we, to find meaningful ways to bring Judaism into our daily lives? Mimi and I have tried various ways of making Shabbat special. Recognizing the prevalence of technology in our lives between our phones and our computers, we tried instituting a No-Screens Shabbat. We sampled various synagogues, but to us the older congregations seemed to be just going through the motions, murmuring the call and response in an listless drone, while the younger ones are too focused on making religion hip, such as beginning Kabbalat Shabbat with a nigun (prayer) to the tune of Madonna’s “Like A Prayer.” We did find one community that fit our sensibilities, Romemu, where Shabbat services balance tradition with meditation, song, and dance, and gave us the feeling we’d left the work week for the sacred time of Shabbat. Unfortunately, it is too far from our home to attend regularly. Also, when we were flush enough, we attended a Jewish learning conference in the Catskills. We still haven’t found the lasting Jewish communal connection we both long for. At some point we lapsed, too, and No-Screens Shabbat gave way to binge-watching Orange is the New Black on Netflix. Now that we’re planning to start a family, the question of how to spiritually imbue our lives with Judaism feels even more important. How are we to do it? It would be easy to coast along marking the major holidays and simply lighting the candles, but I see in my own upbringing that a casual acquaintance with religion might as well be no religion at all. As I look back on my journey, I see a process marked by doubt, struggle, learning, and application. My marriage and conversion forced both Mimi and me to examine our spirituality and what Judaism means to us. Today, we have not found a particular synagogue to belong to or a single branch of Judaism that reflects all our values. Both of us are seeking a meaningful, contemporary way to be observant Jews. I know we will continue to struggle with our faith. But now I also know, there couldn’t be anything more Jewish. Wesley Hopper is a writer, playwright and filmmaker living in Brooklyn, N.Y.
No, I Did Not Convert Because My Husband is Jewish! 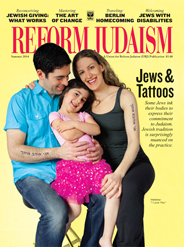 Some Reform Jews express their Judaism by inking their bodies; others make Jewish decisions not to be tattooed. The tradition is surprisingly nuanced on the matter.